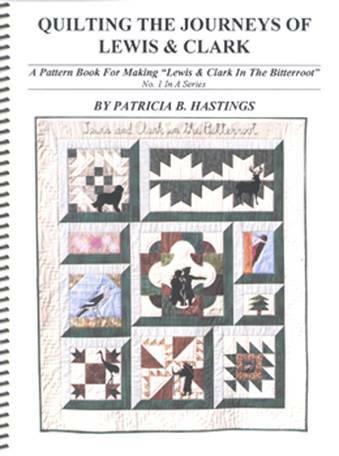 In the first-ever quilt pattern book of its kind, Patricia B. Hastings, one of the Discovery Writers of Stevensville, Montana, whose two books on the Lewis & Clark Expedition have won widespread acclaim and who also is a nationally-known quilt maker, has put together the information to enable anyone to make a beautiful quilt featuring the famous Lewis & Clark Expedition. The theme of this pattern book, the first in a series, is “Lewis & Clark In The Bitterroot,” one of the more rigorous parts of the epic journey as the Corps of Discovery made its way through “those tremendous mountains.” The blocks on the quilt feature events, participants, wildlife and natural features in a stunning array of color. 8 ½ x 11, ring binding.